This month our columnist David Robinson travels back in time to Edinburgh in the 18th-century, when Scotland’s capital was the intellectual hub of the Western world. With Shelia Szatkowski as an illuminating guide, David encounters many new facts about the city, making him look at, and appreciate, Edinburgh in a new (or perhaps more accurately old) light. She was a rebel – the “Little Sisters of No Mercy” had seen to that – so when Sheila Szatkowski left school in Northern Ireland, she didn’t want to go to university there. The Troubles were raging, the tribal divisions were deepening, and in those circumstances, a real rebel doesn’t yearn to stay too close to the farm she grew up on near Magherafelt, Co. Derry, and the fierce predictability of the province’s politics. Not when she can go somewhere like, say, Edinburgh. She caught the airport bus into town, got off at Princes Street and looked south and east, catching her first and always-remembered sight of that “Medieval Manhattan” of Edinburgh’s Old Town ridging the skyline. Then down Dundas Street on the No 19 bus to her student digs in Inverleith Place, and she hadn’t seen anything else as sturdily, stonily refined as the New Town either because, well, who has? That’s the moment Szatkowski’s love affair with Edinburgh and its history began, and it’s a love that infuses every page of Enlightenment Edinburgh: A Guide, published this month by Birlinn. For those of us who have lived in the city for decades, her book is studded with the kind of facts that we should perhaps have always known but – embarrassingly – never did. I must, for example, have passed the six huge sandstone pillars at the front of Edinburgh University hundreds of times. I don’t think I ever noticed that each of them is monolithic, or if I did, I thought nothing of it. Yet just look how enormous they are – and tell me how on earth they ever got there from Craigleith Quarry in 1791, when the Dean Bridge wouldn’t even have been built, and they would presumably have had to be taken down into and hauled up from Dean Village. Of course, Robert Adam could always have compromised on his plans for his alma mater. Those columns could have been cut in, say, four-foot blocks, or compacted, as they are at the back of the courtyard not visible from the road. But what would the point of that be? Because Adam was creating this marvellous architectural statement of intent. Seen anything like this in – where was it you’ve just come from? Thought not. Welcome to Edinburgh. Read Szatkowski’s book and you begin to get a real feel for how the city would have been back then. Those horses pulling the university’s stone columns out of Dean Village, for example, would have noticed the land levelling out as they passed near Charlotte Square. Adam had that project sewn up too, though it would have been a building site at the time. To the south of Charlotte Square, everything down to the Water of Leith – Randolph Place, Ainslie Place, Moray Place remained fields for another 30 years. Go back 30 years to 1763, though, and you might have been able to eavesdrop on Thomas Somerville, a 22-year-old clergyman, being addressed by George Drummond, the driving force behind the creation of the New Town. They were in the Old Town looking across the Nor’ Loch at the land on the other side, where there wasn’t a house to be seen. “Look at these fields,” said Drummond. “You, Mr Somerville, are a young man, and may probably live, though I will not, to see all these fields covered with houses, forming a splendid and magnificent city.” Drain that loch, build a road across: that’s all it would take. He’d been wanting to do that, Drummond confided, ever since he was first made Lord Provost in 1725. As Szatkowski points out, “the enlightenment didn’t happen because of buildings but the people who got together in them”, and her little guide always gets the balance right. But whereas many such guides would concentrate on the giants of Enlightenment Edinburgh – David Hume, Allan Ramsay, James Craig, the Adam brothers – Szatkowski widens the field. There’s a reason for that, and he’s a Dalkeith-born barber and artist called John Kay. Szatkowski’s one-woman mission to spread the word about John Kay is impressive. Already, she has restored his grave at Greyfriars Kirk, and ten years ago produced Capital Characters, a lovely little taster of Kay’s work, for Birlinn. Now she’s working on a biography of him, but really, she says, there ought to be a museum devoted to his work. I wouldn’t put it past her. All the same, for such a small book, it’s taught me a great deal. Here’s a tiny example that links up almost everything in this story. The first great public building in Edinburgh beyond the Old Town, she points out, was William Adam’s Royal Infirmary of Edinburgh, begun in 1738. It lives on in the name of Infirmary Street, which was at its front, while what we now know as Drummond Street (named after that visionary Lord Provost of the previous century) was at its back. The Adam brothers would have often passed their father’s impressive four-storey, 228-bed hospital. Maybe they were even tempted to outdo it: the new university was, after all, only a couple of hundred yards away. Yet now, and since the original Royal Infirmary was demolished in 1882, the only signs that it ever existed are a couple of Grecian urns on top of the entrance pillar to High School Yards, just as Drummond Street starts sloping down towards the Pleasance. Kay wouldn’t have known William Adam, but he would have known his two sons, Robert and John, George Drummond, and a whole host of teachers at the nearby university. He would have known a lot of those eminent Edinburghers who walked that street down to the city’s first Royal Infirmary, and in drawing their likenesses, he was producing a unique portrait of a city. Unique is, of course, a dangerous word to use. But as far as Szatkowski knows, in all of North America, in all of Britain – maybe even anywhere – at that time, there wasn’t anyone quite like Kay, drawing hundreds of his fellow citizens – including at least 30 whom even she hasn’t yet been able to identify. So if you want a portrait of any 18th-century city in the world, you’d best start off with Edinburgh. You can look at those Grecian urns that still stand in Drummond Street and think about the missing hospital and what the past has taken away. Or you can walk around the corner, look once more at those monumental pillars fronting Edinburgh University – and whole swathes of the rest of the city – and look at what the 18th-century’s glorious dead have left for us, the living, to enjoy. 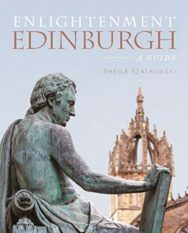 Enlightenment Edinburgh: A Guide by Sheila Szatkowski is out now published by Birlinn priced £12.99.